A fridge magnet I once read, apparently a Spanish proverb, said something like “How beautiful to do nothing and then rest afterwards”. As mentioned in my song Having Fun, sometimes it is possible to try too hard. It takes great strength to surrender and allow the creativity of the universe to reveal itself. Focus and action are definitely needed to consciously create a satisfying life. Your purpose though is to ask for what you want, work toward that, but not to control how everything will come to you. By obsessing with control, you block the good that wants to come your way. So comes a time in your life when you have to wait things out, to do what looks like nothing but is actually something. The act of letting go and staying present, trusting that things are already in place and will unfold at their right time, is a courageous but rewarding one. In the meantime, allowing oneself pleasure is equally important. Think of a child and the trust they have in each day, staying fully present and allowing goodness to flow their way. This was your natural state, long before the mind and ego developed imagined fears and got in the way. At times when you have to let go and take another leap of faith, waiting for things to fall into place, the best thing you can do is to try and enjoy yourself. This is easier said than done of course. But it brings you to a space of receiving. It allows the good to flow in. When you are unhappy, scared, in a panic, or knotted up in fear, you are generating energy relating to the fear and giving it more power. When you let go, do something creative, or simply rest, you are nurturing your soul and opening yourself up to all the good that is waiting and wanting to flow your way. Appreciate the gift of such time, get creative, have fun. Try drawing, cooking, sculpting, writing, music, anything. It doesn’t have to be a work of art worthy of gallery walls or five star restaurants. It is simply doing something you enjoy. It may be lying on the lounge and daydreaming, free of guilt that you should be doing something else. Like a mighty tree, you grow in spurts. There will be times you will have rapid periods of growth. This is followed by times of rest, before the next surge of growth begins. It benefits no one, least of all yourself, to race through life at a crazy pace feeling that if you are not doing something, then you are wasting your time. In truth, you are wasting your time by doing too much. Take action when it is time to take action. Rest when it is time to rest. Much, much more is achieved through balance and happiness. It takes courage to let go. It also takes determination to allow yourself time to play or to do nothing, without guilt. Guilt is a poison and serves no one. Try sitting by a creek, dangling your feet in the water. Perhaps draw something with chalk or try moulding clay. Or simply enjoy doing nothing. And then rest afterwards……of course. 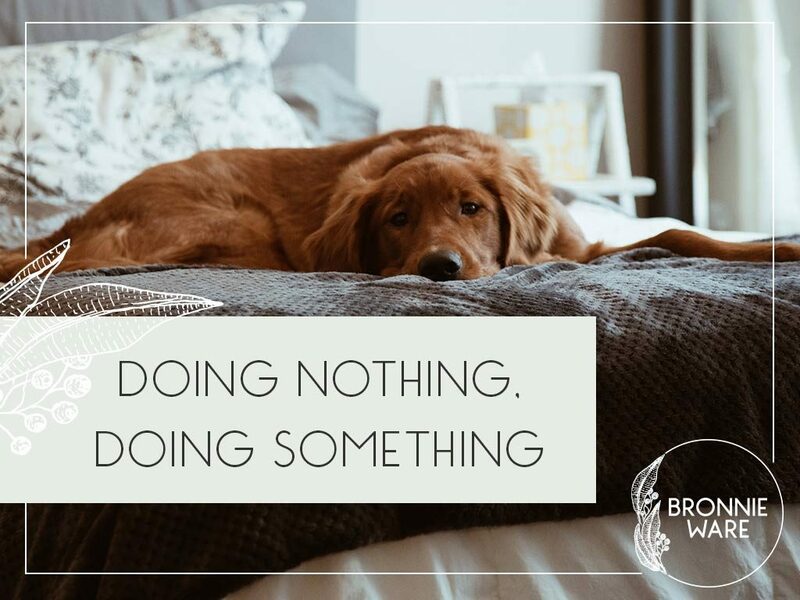 Doing nothing is never truly doing nothing. Doing nothing is doing something, something very important for both your wellbeing and your ongoing journey. It allows good to flow. It energises you and returns some balance into your life. Go on. Give yourself such a gift because sometimes doing nothing is doing everything.